After vulcanization, molding and washing & squeezing, the latex products need further drying process. However, the traditional dryer need take a longer time to dry latex products because latex physical structure has a poor permeable for the air blowing. 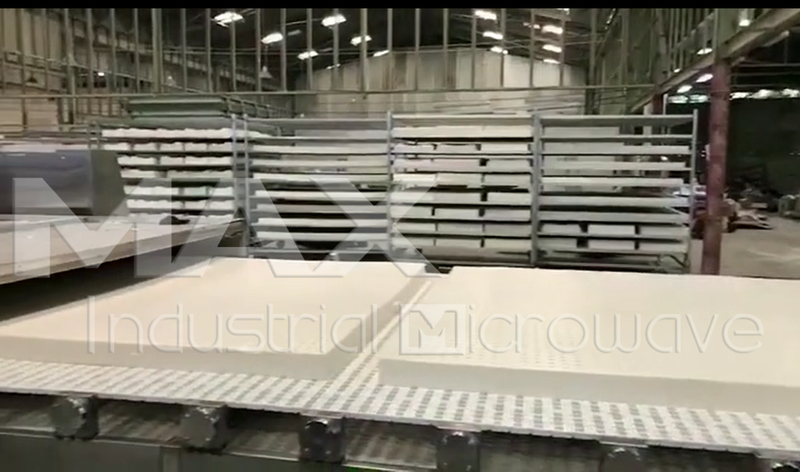 In addition, the good thermal insulators feature of latex material slow the drying process by the conventional drying oven.But,microwave dryer could perfectly solve the problems because of stronger penetration ability and unique heat transmission (selective water drying) as well as dry quickly with no surface overheating or yellowing effects. The microwave dryer for latex products is specially used for drying latex mattresses, latex pillows, latex sheets, latex powder, latex particles, latex, latex shoe materials, latex insole, latex foot bed, latex half fork, latex cushion heart, movable insole and other latex products. 1. The drying temperature is low, but it can quickly dry the moisture content of latex and latex products. 2. Internal and external moisture can achieve uniform drying. 3. Drying and drying of latex and latex products can be sterilized, mold. 4. Tunnel conveyor microwave belt machine is fully automatic drying line which saves the labor cost. 5. The drying temperature and drying speed can be adjusted. Moreover, microwave sterilization equipment can be used for cassia seed pillow, mung bean shell pillow, PE tube pillow, lavender pillow, buckwheat pillow, fragrant pillow, sachet and other sterilization, killing mold, larvae, insect eggs, mites etc.